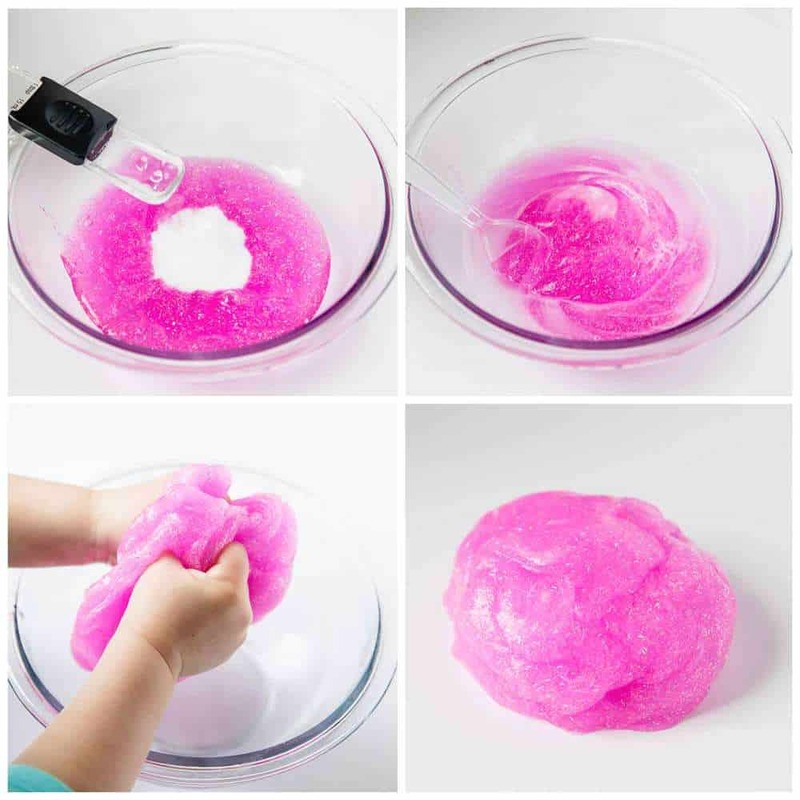 This Glitter Glue Slime is made with only 3 ingredients and has a vibrant pink color that’s loaded with glitter! Such a fun and festive craft that will keep the kids entertained for hours. Homemade slime is one of my kid’s favorite crafts! It’s so easy to make and there are so many fun variations, like classic slime, fluffy slime and sand slime. I love that it’s an inexpensive activity that will keep the kids entertained for hours! One of my kid’s favorite activities to do when it’s cold and rainy outside is to make homemade slime. And since Valentine’s Day is right around the corner, we made PINK glitter slime over the weekend! It turned out so cute and has such a vibrant pink color. Plus it’s loaded with glitter…which my girls loved! This glitter glue slime entertained them for hours and they had so much fun playing with it. You could easily make other colors of glitter glue slime too, like blue, green, purple, orange… you name it! Just buy the color of Elmer’s glitter glue that you prefer. And feel free to add in more glitter to give it an extra shimmery look! What are the ingredients for glitter slime? 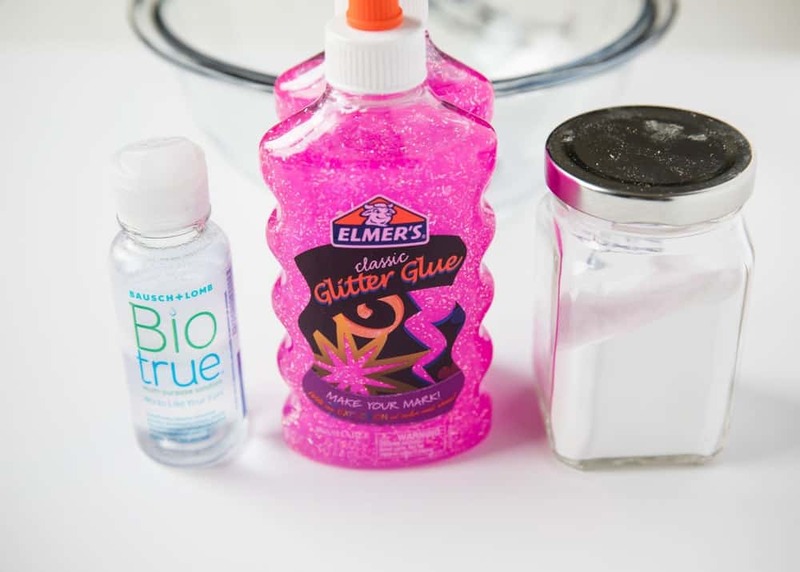 This glitter slime is SO easy to make when you buy the Elmer’s glitter glue. 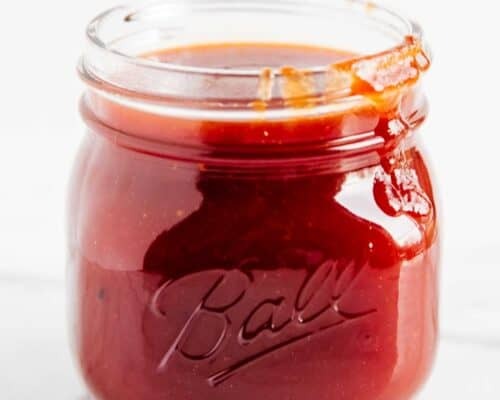 You only need 3 simple ingredients. Check them out below. You could also add more glitter to the glitter slime recipe to make it extra festive! 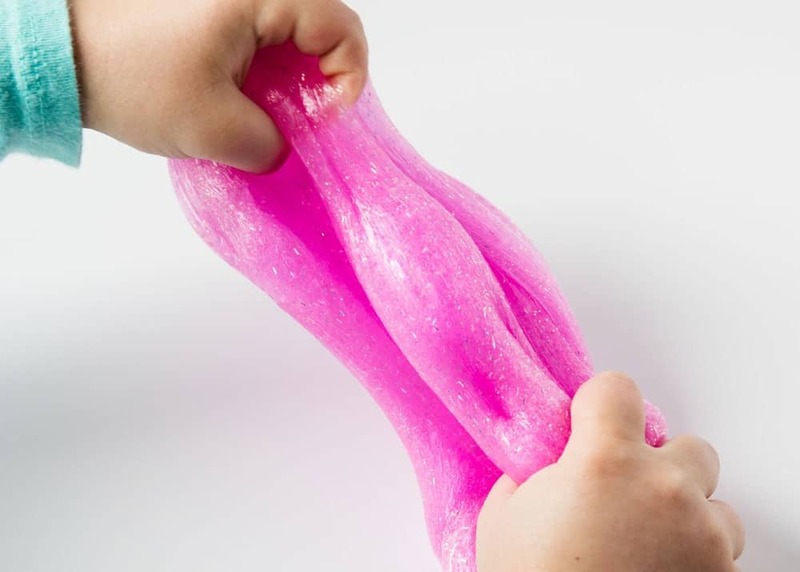 This glitter glue slime is so simple and keeps the kids entertained for hours! Follow the steps below to get started. Scroll down for the printable glitter slime recipe. Pour Elmer’s glitter glue into bowl and add baking soda to middle. Then pour contact solution on top. Stir ingredients together until you can no longer stir. Then mix the liquid that’s still in the bowl into the slime with your hands. This will take about 1-2 minutes. The glitter slime will no longer be sticky once it’s all mixed together properly. Wash hands, then you’re ready to play with your slime! TIP: It’s best to keep the glitter slime in the kitchen…you don’t want to find it in the carpet! Also helpful to put girls hair in a pony tail, so the slime doesn’t get in their hair. If you find slime in their hair, don’t worry. Just rub a little coconut or olive oil on it and comb it out. Can I add glitter to slime? Sure! If you want your glitter glue slime a little more glittery, feel free to mix in additional glitter. Try experimenting with different colors of glitter or even fun glitter shapes like stars or hearts. So much fun! How do you store glitter glue slime? 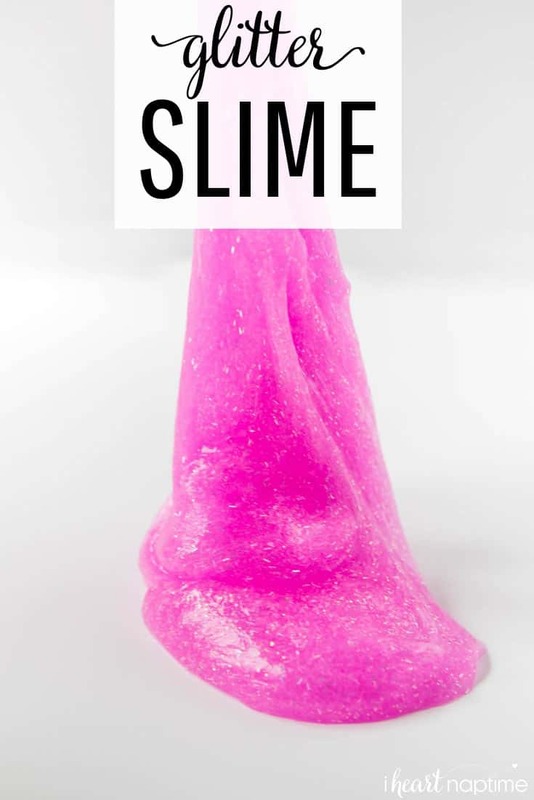 This Glitter Glue Slime is made with only 3 ingredients and has a vibrant pink color that's loaded with glitter! Such a fun and festive craft that will keep the kids entertained for hours. Pour the glitter glue into a bowl. Then add the baking soda to the middle. Pour the contact lens solution over the top. Stir until your can no longer stir. There will still be liquid in the bowl. Mix the liquid into the slime with your hands until it has all worked in (about 1-2 minutes) and is no longer sticky. It will not be sticky when it is all worked in. Wash your hands and then get ready to play with your glitter slime. Store in a plastic container with a lid or zip top bag. My kids loved making this! Thanks so much for the fun idea! This slime is so much fun! Perfect for snow days! 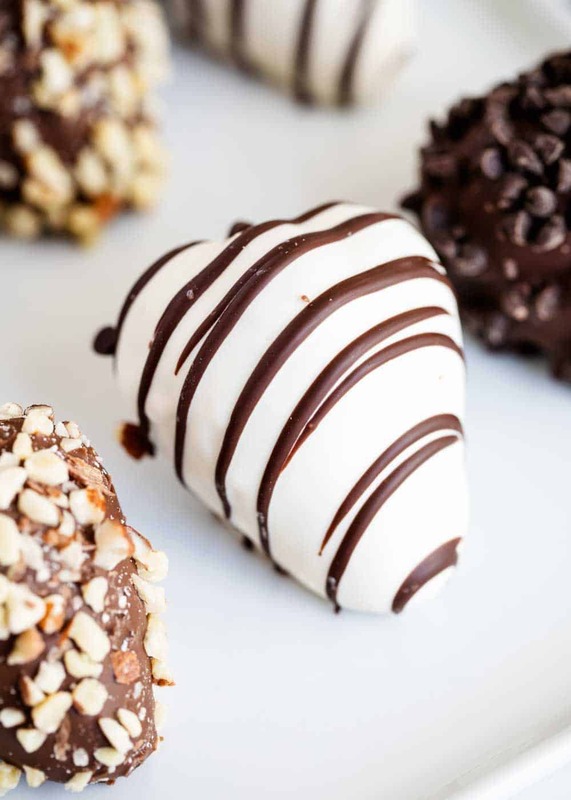 So fun, and perfect for valentine’s day. My girls will love making this! My kids would love to make this! I am saving tis for the next rainy day! This is so fun, my girls LOVED making it!! !